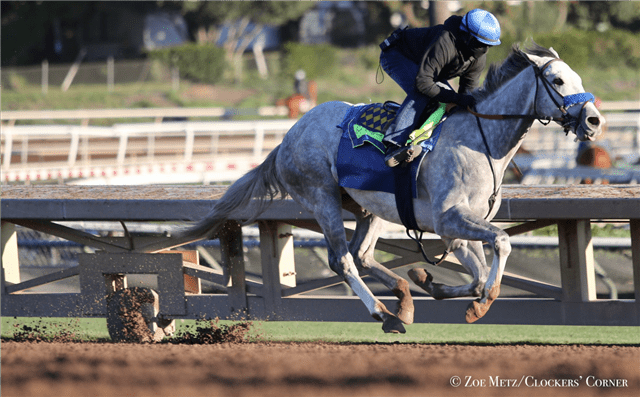 Bob Baffert's Coliseum and Jerry Hollendorfer's Gunmetal Gray head a field of seven sophomores going a flat mile in Saturday's Grade III, $100,000 Sham Stakes at Santa Anita. The Sham, named for the winner of the 1973 Santa Anita Derby who was subsequently second to the immortal Secretariat in both the Kentucky Derby and Preakness Stakes, will provide the winner with 10 Kentucky Derby qualifying points. Owned and bred by Godolphin, LLC Coliseum made his highly anticipated debut this past Nov. 17 at Del Mar, and he responded with a rousing 6 ¾ length going seven furlongs at odds of 1-2. Gun Metal Gray, who fetched $225,000 at a 2-year-old in training sale in Ocala, Fla., this past March, broke his maiden in his second start going one mile on Aug. 22. He was subsequently second to Baffert's Game Winner in the Grade I American Pharoah Stakes here on Sept. 29 and was again well beaten by Game Winner, finishing fifth, beaten 12 ½ lengths in the Grade I Breeders' Cup Juvenile Nov. 2. After many years of taking the Dubai route to Churchill Downs, Godolphin has enlisted the services of Baffert in the hope he can lead them to the promised land at long last on the first Saturday in May. A grey colt by Tapit, out of the Menifee mare Game Face, Coliseum was bred in Kentucky by his owner and should relish the extra furlong on Saturday. Coliseum looms strictly the horse to beat with Joe Talamo back aboard. Well beaten in his six furlong debut July 29, this Kentucky-bred colt by Exchange Rate relished the stretch out to a mile on Aug. 22 at Del Mar, winning by 6 ¾ lengths under Drayden Van Dyke. With Flavien Prat taking over, Gunmetal was a good second, beaten 4 ½ lengths by Game Winner in the mile and one sixteenth Grade I American Pharoah, a race in which he earned a 90-Beyer Speed figure, his best “number” in four juvenile starts. With Mike Smith taking over for the first time in the Sham, his connections are hoping Gunmetal Gray's experience will give him a competitive edge as he faces Coliseum for the first time. Special early first post time for a 10-race card on Saturday is at 12 noon. For additional information, please visit www.santaanita.com or call (626) 574-RACE. This entry was posted in NL List, Racing and tagged 2019 kentucky derby, Bob Baffert, coliseum, gunmetal gray, jerry hollendorfer, santa anita park by Mike Willman/Santa Anita. Bookmark the permalink.